Spring reverb is the broadband resonance generated by vibrating one or more metal coils held under tension. 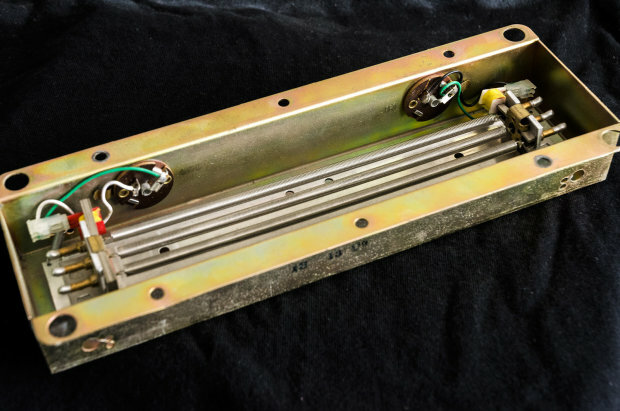 A spring reverb unit is comprised of three main components: one or two drivers, metal coils housed in a pan and one or two pickups. The combination of the pan and springs is referred to as a “tank”. 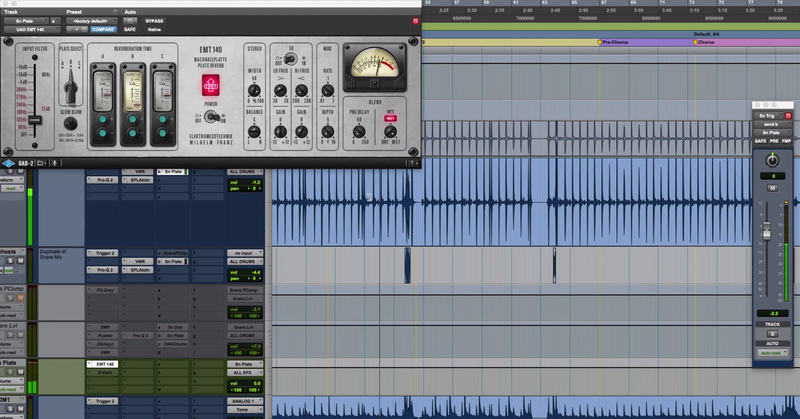 Spring reverbs can be mono or stereo depending on their configuration. The more “traditional” spring reverb is mono in, mono out, but stereo is easily achievable by adding a second tank. And some reverb units actually use multiple tanks even in single summation to increase the richness of the sound, which we’ll get to later. The basic concept is this: a transducer converts an electrical signal into mechanical motion. That mechanical motion modulates the spring which then carries a similarly shaped wave across its length and mechanically moves a magnet on the other end. This moving magnet generates current across a pickup which is then amplified into an output signal. The spring itself continues to carry that wave back and forth along its length. This effectively turns a single impulse of energy into a decaying wave shape. This “tail” creation of fast “echoes” is most of the reverb sound. However, the skewing of the sound itself adds to this effect. The natural inertia of the spring coupled with electrical resistance and inductance change the transient response and frequency response. The presence of multiple springs increases the diffusion effect and comb filtering. And this all equates to something that … still kinda doesn’t exactly sound like reverb but kinda sorta does. Springs have a number of qualities that make them particularly unique sounding. The main quality of a spring reverb is the quintessential “bouncy” quality. This is due to the timing between echoes. In order to create each reflection, the wave needs to travel the length of the spring, hit the transducer, bounce back the length of the string, hit a boundary and once again travel the length of the spring back to the transducer. Springs are low-frequency focused in a very specific way. Spring reverbs propagate rotational transverse waves. Ahhhhh. Ok, in English that means that the coils in the spring are actually rotating and then causing subsequent coils to rotate and that’s effectively what’s creating the wave shape. One of the weird byproducts of this movement is that low frequencies (with their longer wavelengths) actually rotate more coils than high frequencies. In other words, while the highest of frequencies might only cause single coils to turn at a time, lower frequencies may be moving multiple coils simultaneously. This affects the sound in two ways. First, it requires the higher frequencies to do more work to cover the same distance, making that energy decay faster. Second, it causes the lower frequencies to actually travel the length of the coil faster than higher frequencies. Basically, it’s the opposite of a plate reverb. Our ear gets the low frequencies before the high frequencies which tells our lizard brains that the spring is “dark” sounding. Springs also have very unique tails. The existence of coils kind of acts like band splitters, and while the first set of echoes all arrive in a similar time frame, as time goes on, frequency timing becomes more and more divergent. While the first set of reflections are very discrete, the later reflections almost sound more “continuous” as the wave shape distorts and frequency content separates further. This is what gives spring reverbs their very specific “depth-like” quality. Lastly, there are many minute factors that contribute to the sound of a spring. The gauge of the wire, diameter of the coil, composition of the metal, tension on the spring, length of the spring, the sound of the tank itself, and the circuit amplification stages all amount to the tone and tail shape. When multiple springs are suspended in the tank at different tensions, the timing of all these changing reflections interact and create a more believable reverb. Now that we understand how a spring reverb works, let’s talk about why we might choose the sound of a spring in our music. Surrealism. The not-reverb but kinda-reverb sound of a spring is very surreal. It’s no wonder it became a quintessential element in the sound of Psychedelic Rock. It’s a compelling sound that paints an unworldly picture. Texture. Even the smoothest of spring reverbs are very textural. If I have a sound that feels too “smooth” or a bit bland, a dash of spring reverb can be the perfect tool to breathe some life and originality right into it. Blending. Much like Plates, the two-dimensional quality of spring reverbs allows them to exist within other spaces without clashing. I find it easier to get a spring reverb to coexist with a natural space than it is to make a realistic sounding room algorithm do the same. Guitars. Many guitar amps have spring reverbs built right in. Because of this, the springs are to guitars the way ketchup is to hamburgers. We’re just culturally very used to the sound of spring reverb with guitar.